San Francisco de Asís Mission Church, c. 1772, is one of the best known and most photographed churches in New Mexico. The Spanish Colonial adobe building has twin bell towers and an arched portal entrance that overlooks an enclosed courtyard. The interior has a large carved reredos (altar screen) divided into painted panels, a ceiling of vigas (beams) that rest on elaborately carved double brackets and a traditional choir loft. San Francisco de Asís Mission is an active parish. 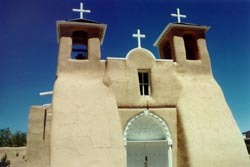 San Francisco de Asís Mission Church, a National Historic Landmark , is in the Ranchos de Taos plaza four miles southwest of Taos, New Mexico, on NM 68. Open from 9:00am to 4:00pm. Please call 505-758-2754 for further information.